includes powder foundations, liquid formulas can be mineral foundation too. Jane Iredale Glow Time Full Coverage Mineral BB Cream £39.95* The lowdown: it covers everything. Blemishes, dark spots, hyper-pigmentation, enlarged pores and fine lines. You name it. It covers it! Jane Iredale Glow Time Full Coverage Mineral BB Cream not only covers it cares, as it's enriched with apple and grapefruit extracts, vitamin E, sunflower seed oil and aloe leaf juice. Applied directly to the skin (less is more) with fingers, or a damp beauty blender, the thick cream doesn't necessarily blend with ease and requires a little more work than your average BB cream, but leaves a lovely velvet matte finish on the skin. The mineral based formulation also offers a SPF of 25, is water resistant for up to 40 minutes, is long wearing, non-comedogenic, hypoallergenic and works well when used alone under the eyes as concealer. Jane Iredale Lip Fixation in Craving £22.00* The Jane Iredale Lip Fixation in Craving is a wonderful lip product. I'm truly fixated. True to form, the lip stain and (non-sticky) gloss duo offers long lasting colour, with a subtle glossy finish that doesn't bleed or feather. Craving is a light muted pink with a clear gloss and the shade is similar to my favourite liquid lipstick Serenity by Gerard Cosmetics but less pink. The product is versatile as the stain can be worn with or without the gloss and the colour is buildable and although opaque deepens with each application. Applied to the lips, the stain applies wet and then dries down to a demi-matte finish and feels soft and very comfortable on the lips. 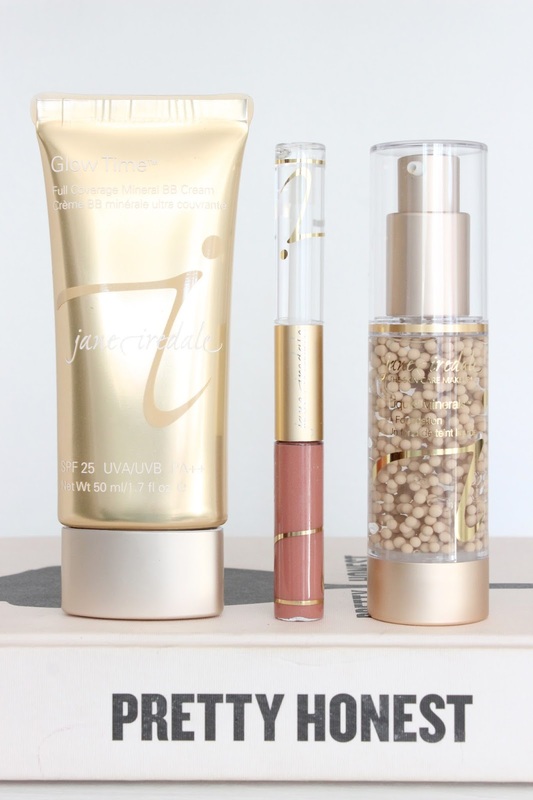 Jane Iredale Liquid Minerals A Foundation £39.95* As much as I like a full coverage base, light and natural bases suit me best for everyday wear. And Jane Iredale Liquid Minerals A Foundation offers just that. The clear packaging showcases beads of pigment sat amongst aloe vera gel and vegetable glycerin. The one-of-a-kind foundation has a formula that boasts goodness, with hyaluronic acid to help retain hydration levels, vitamin C to protect the skin against environmental damage and coenzyme Q10 to rejuvenate the skin and help prevent and reverse visible signs of ageing. And it's also paraben, talc, fragrance free and non-comedogenic! To combine the pigment and moisture you simply press down the pump. However, be cautious that on first use, the initial few pumps will release clear gel before the pigment mixes. The texture is a little strange, applied to the back of my hand it appears gritty, but it is in fact silky and watery. Two to three pumps leave a natural, light dewy finish on my skin and similarly to my Laura Mercier Tinted Moisturiser it gives a soft focus finish, diminishing fine lines and enlarged pores. Have you tried anything from Jane Iredale?